A campaign group in the UK has asked the Egyptian authorities for help in its fight to have an ancient Egyptian statue returned to public view after it was sold by Northampton Borough Council to a private collector. Despite an international outcry, the 4,500-year-old Sekhemka statute was sold two months ago to an unknown collector for £15.76 million. The statue, which dates from the Fifth Dynasty and is believed to show Sekhemka the scribe with his wife Sitmerit, was given by the Marquis of Northampton to Northampton Museum as gift in around 1870. The Save Sekhemka Action Group told Ahram Online it was conducting enquiries into how the statue was acquired by the Marquis. “We are seeking to check if the statute was legally exported out of Egypt,” said Gunilla Loe, chair of the action group. The group is also trying to open channels with Egypt’s Antiquities Minister Mamdouh El-Damati to discuss future action. “Selling the Sekhemka to a private collector and depriving the public of the right to see it is an international scandal,” Loe added. The group pledges not give up until the statue is returned to public view at Northampton Museum. It is believed there is no other statue like Sekhemka in a UK museum. It has asked for information on the legal agreement between Lord Northampton and the museum on the sale of the statue. But the museum considers the issue closed. 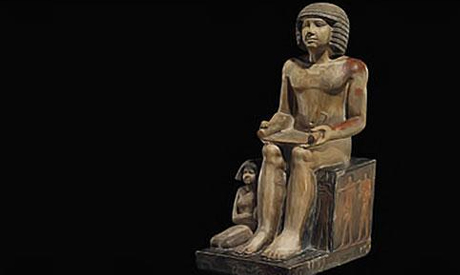 "Sekhemka has now been sold and we are focusing on the future," a museum spokesperson told Ahram Online. It is widely believed that Lord Northampton agreed late in 2013 to transfer his claim to the ownership of the statue to the museum in exchange for 45 percent of an eventual sale price, while the museum keeps 55 percent and pays all auction house fees. On 1 August, the museum lost its accreditation status after the controversial sale of the statue. Egypt condemned the sale as an "an affront to Egyptian archaeology." The museum earlier told Ahram Online it had contacted Egyptian officials two years ago regarding its plan to sell Sekhemka, a claim categorically denied by the Egyptian embassy in London. The campaign group said it regrets the museum's loss of accreditation because this stops it being eligible for outside grants from the Lottery, Arts Council England and other arts and cultural grant-giving bodies. Northampton Borough Council said the Arts Council's decision was "disappointing" and "puzzling." It argues it had to sell the statute to collect money to fund a multi-million pound investment plan for its museum service.